Now that Super Two season has just about wrapped up, it looks like we'll be seeing the influx of the surefire, can't miss Hall of Fame prospects. Stephen Strasburg is set to make his debut on Tuesday. I believe his game will interrupt every television broadcast like a Presidential State of the Union. 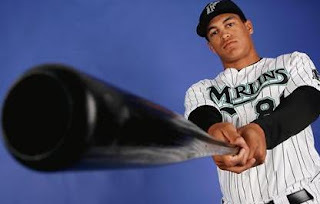 The 6'5, 230 pound home run machine, Mike Stanton, will probably make his MLB debut on Tuesday as well. The Marlins' top prospect has 21 home runs and is hitting .311/.441/.726 in AA this year. It's rumored that he has the Eye of Thundera embedded in his bat to help him hit those moon shots. What are you waiting for fantasy nerds? Go pick him up. And baseball nerds, buckle in. We have a busy week ahead of us.